What is Moebius Syndrome and How Is It Treated? Facial Paralysis can be devastating for people of any age, but especially for young children. Moebius syndrome is a rare congenital disorder that causes facial paralysis that can be apparent as early as birth. Children who grow up with Moebius syndrome face many challenges both physically and emotionally which can take a toll over time. Luckily, facial nerve expert Dr. Babak Azizzadeh has helped countless patients with Moebius syndrome improve their facial paralysis and overall quality of life. Since his extensive and prestigious training at Harvard Medical School, Dr. Azizzadeh has helped hundreds of patients with varying forms of facial paralysis. Dr. Azizzadeh founded The Facial Paralysis Foundation in 2003 which offers support and education to people affected by facial paralysis. 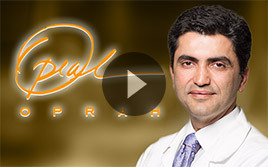 Dr. Azizzadeh has become world-renowned for his facial nerve expertise and has been featured in various media outlets including the Oprah Winfrey Show. Dr. Azizzadeh is widely recognized for his results with microsurgical facial reconstruction which is often required for patients that are born with facial paralysis. Most recently, Dr. Azizzadeh has been asked to host the International Facial Nerve Symposium in 2017 which is considered one of the biggest honors in the field of facial paralysis. Moebius syndrome is a rare genetic disorder that is often present at birth. It most prominently affects the 6th and 7th cranial nerve which results in difficulty making lateral eye movements. Patients with Moebius syndrome typically have trouble smiling, frowning, sucking, grimacing, and blinking their eyes. Additionally, Moebius syndrome can affect other cranial nerves that can cause skeletal, respiratory, and speech problems. The most prominent symptom of Moebius syndrome is facial paralysis. Unfortunately, children with Moebius syndrome can’t make standard facial expressions. They are unable to smile, frown, and raise their eyebrows. Aside from the physical difficulty caused by Moebius Syndrome, facial paralysis often creates extremely challenging psychological challenges as well. As children born with Moebius syndrome begin to grow up, they realize that their face works differently than those around them. Treatment options should be explored before the child enters school to help minimize the psychological ramifications that come along with this disorder. 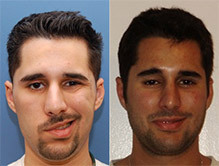 There are a variety of surgical procedures that Dr. Azizzadeh performs to help patients with Moebius syndrome. Most patients benefit from a procedure called microsurgical trigeminal-gracilis muscle transfer. This procedure involves transfer of the gracilis muscle from the inner thigh to the face. It is attached to the trigeminal nerve which controls the muscles for chewing. This muscle and nerve transfer allows the child to control the movement of their face voluntarily. 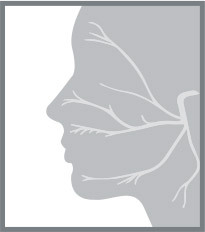 For this procedure, each side of the face must be performed in separate stages. Ideally, the first operation is performed when the child is 6 years old, and the second stage of the surgery is completed a year later. There are other surgical procedures that can be performed like a static suspension with tensor fascia lata, temporalis transfer, or eyelid reconstruction. 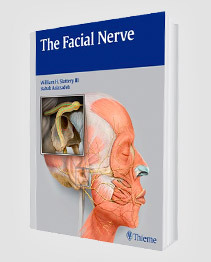 A facial nerve expert like Dr. Azizzadeh needs to assess the patient to determine what procedure is most appropriate.